Have you ever had burrata cheese? If you follow food trends, you may know that it’s one of those “it” ingredients these days. The “it” status is well warranted because it is over the top amazing and it makes this salad, which has so many wonderful things going for it, a masterpiece. Burrata is an Italian invention and it is essentially mozzarella and cream. Really. The outer part is pure mozzarella and the inside is a soft mixture of mozzarella and cream. Or it can just be described as mozzarella times 10. It can be hard to find (Seattle people can find it at DeLaurenti) and it is expensive ($28/pound) but it really is one of those magical transforming things. Because it is so rich, you really don’t need much. I scaled up this recipe and was planning on buying 1 1/2 pounds of it. When I saw the price, I quickly brought that amount back down to 1/2 pound and supplemented with fresh mozzarella (again for Seattle folks, DeLaurenti makes their own mozzarella on the weekends.) As I was tucking the cheese in among those gorgeous heirloom tomatoes, I realized that I probably didn’t even need the extra cheese. 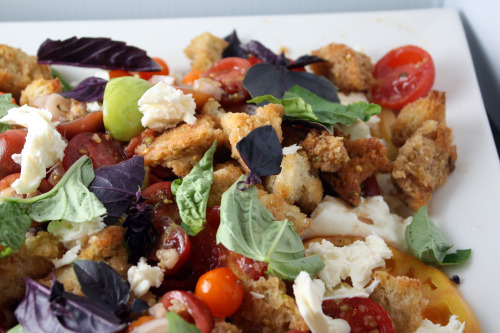 The guys, all of whom had never heard of burrata, went totally crazy over this salad – especially the cheese. Don’t forget – you have a chance to win a copy of The Big Sur Bakery Cookbook by telling me about your favorite cookbook here. This is the recipe as written but as I mentioned above, you could use less cheese. If you are unable to find burrata, I would use fresh ricotta or soft goat cheese rather than mozzarella. If this recipe seems overly fussy for what is essentially a tomato and bread salad, please proceed and make it. It’s worth the effort. Preheat the oven to 375°F. Cut the crust off the bread and tear the remaining loaf into rustic 1-inch pieces. Using your hands, toss the pieces with 2 tablespoons olive oil, squeeze the bread gently to help it absorb the oil. Toast on a baking sheet 12 to 15 minutes, stirring a few times, until the croutons are golden brown and crispy on the outside but still a little soft and tender inside. Stem the cherry tomatoes and cut them in half. Core the heirloom tomatoes. Cut half of them into wedges and set them aside. Then one by one, hold the remaining tomatoes on their sides and cut them into 1/2-inch-thick slices. Season the slides with the fleur de sel and some pepper. Place the slices overlapping on a large platter, spoon a little of the vinaigrette over them, and scatter a little basil on top. Toss the heirloom wedges and cherry tomatoes gently in a large bowl with the sliced shallots, 1/2 tsp. kosher salt, a pinch of pepper, and 3 tablespoons of the vinaigrette. Taste for seasoning, adding more vinaigrette if you like. Gently toss in the croutons. 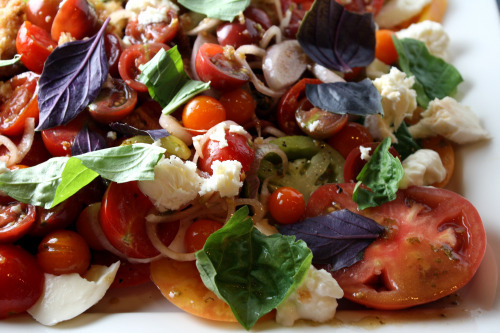 Arrange the salad on the platter, piling it in the center, allowing the slices of tomato and cheese to peek through. Scatter the parsley and remaining basil leaves over the top of the salad. I’m behind on your prolific posts! My mouth literally watered looking at this beautiful salad. Wow. Have a great party–I’m sure you’ll just pick up a bucket of KFC or something. And I’m not entering your cookbook contest because my husband might divorce me if I brought another home. I’m sitting here wishing I could reach into the screen! Those tomatoes are incredible, and I do love burrata and mozzarella. What an incredible salad! Good luck with your party! Ive seen burrata in recipes, but never had it. I’m glad you posted this. Mozzarella + cream?! im in! Never heard of burrata. Wonder if I can find it in South Florida? I think I would love it. I’ll keep my eyes peeled for it. I adore farro and this salad looks divine. I’ve never had burrata cheese. This looks heavenly. I’ll keep a lookout for it in our local whole foods. I’ve never heard of burrata but it sounds delicious! And what an insanely gorgeous salad Dana. This is a weekly meal in our house. We have the best Jersey tomatoes….I mix them with sweet little cherry tomatoes, yellow and red and am in love with milky Burrata cheese. My cheese man gets it every Thursday, flown in from Italy. My mouth is watering! I will be on a hunt for this cheese this week!! Your pictures are just fantastic. Just printed this out and added it to my ‘Recipes to Try’ file. My parents just graced us with some of their bumper crop of heirloom tomatoes. There is just NO comparison!